Behold, the Kraken awakes! 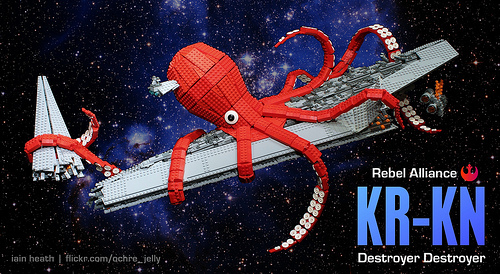 Iain Heath (Ochre Jelly) debuted his “KR-KN Destroyer Destroyer” at SEALUG’s LEGO display at Emerald City Comicon last month, and I’ve been waiting impatiently for him to get it online. The official LEGO Star Wars 10221 Super Star Destroyer set is, frankly, a bit dull, so Iain has jazzed it up with a space monster of epic proportions. Read Iain’s backstory on The Living Brick, and go see it in person at Tableau Software, home of Seattle’s next batch of IPO millionaires.